Active galaxies are galaxies that have a small core of emission embedded at the center of an otherwise typical galaxy. This core is typically highly variable and very bright compared to the rest of the galaxy. For normal galaxies, we think of the total energy they emit as the sum of the emission from each of the stars found in the galaxy, but in active galaxies, this is not true. There is a great deal more emitted energy in active galaxies than there should be and this excess energy is found in the infrared, radio, UV, and X-ray regions of the electromagnetic spectrum. The energy emitted by an active galaxy, AGN for short, is anything but normal. So what is happening in these galaxies to produce such an energetic output? Most, if not all, normal galaxies have a supermassive black hole at their center. In an active galaxy, its supermassive black hole is accreting material from the galaxy's dense central region. As the material falls in toward the black hole, angular momentum will cause it to spiral in and form into a disk. 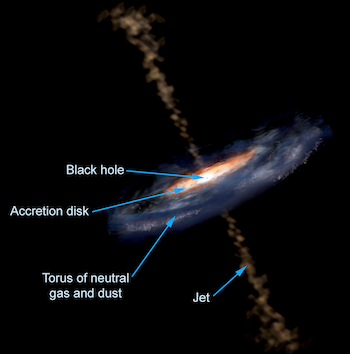 This disk, called an accretion disk, heats up due to the gravitational and frictional forces at work. 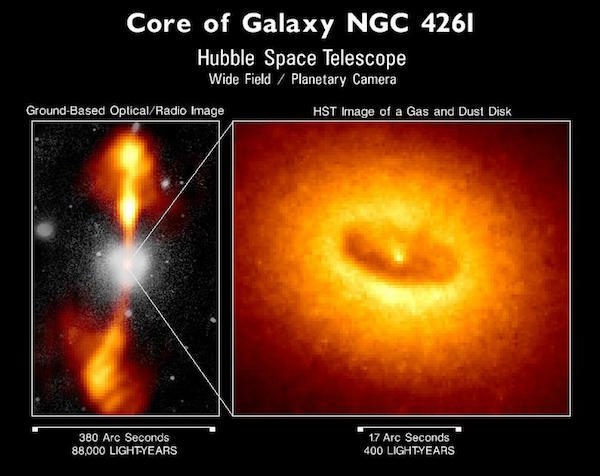 Models of active galaxies also include a region of cold gas and dust, thought to be in the shape of a giant donut with the black hole and accretion disk nestled in the donut's hole. In about one out of ten AGN, the black hole and accretion disk produce narrow beams of energetic particles and ejects them outward in opposite directions away from the disk. These jets, which emerge at nearly the speed of light, become a powerful source of radio wave emission. The properties of an active galaxy are determined by the black hole's mass, the rate of accretion onto the black hole, whether or not it has a powerful jet, and the angle at which we view the galaxy. Radio galaxies, quasars, and blazars are AGN with strong jets that can travel outward into large regions of intergalactic space. Some of the apparent differences between types of AGN are due to our having different orientations with respect to the disk. With blazars and quasars, we are looking down the jet. Active galaxies are intensely studied at all wavelengths. Since they can change their behavior on short timescales, it is useful to study them simultaneously at all energies. 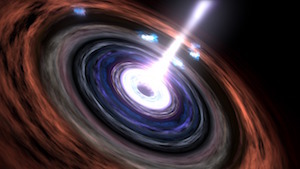 X-ray and gamma-ray observations have proven to be important parts of this multiwavelength approach since many high-energy quasars emit a large fraction of their power at such energies. The X-rays in AGN originate from very near the black hole, so X-ray studies can provide scientists with unique insights into the physical processes occurring in the central engine. In addition, gamma-ray observations alone can provide valuable information on the nature of particle acceleration in the quasar jet and clues as to how the particles interact with their surroundings. The left image shows a ground-based composite optical and radio view of elliptical galaxy NGC 4261. Photographed in visible light (white) the galaxy appears as a fuzzy disk of hundreds of billions of stars. A radio image (orange) shows a pair of opposed jets emanating from the nucleus and spanning a distance of 88,000 light-years.